We at Literary Photographer world headquarters firmly believe that books as objects can be as just as important as books are to read. Gaspereau Press , in Kentville, Nova Scotia, produces some beautiful books. 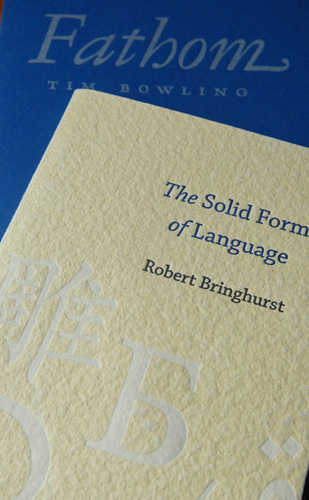 See the accompanying photo of two books from Gaspereau, Tim Bowling’s Fathom and Robert Bringhurst’s The Solid Form of Language.